Wildfires in California: The New Normal? It’s been a year since the worst fires in the modern history of California swept through Northern California creating a path of unprecedented destruction. Then there was the Thomas Fire that erupted on December 4, 2017, and the Montecito debris flow a month later. The Mendocino Complex fire and the Carr fire broke out in late July 2018, and the Delta fire followed in August. The newsletter this month presents the extent of the damage from these events and raises the possibility that this kind of carnage might be the new norm in California going forward. 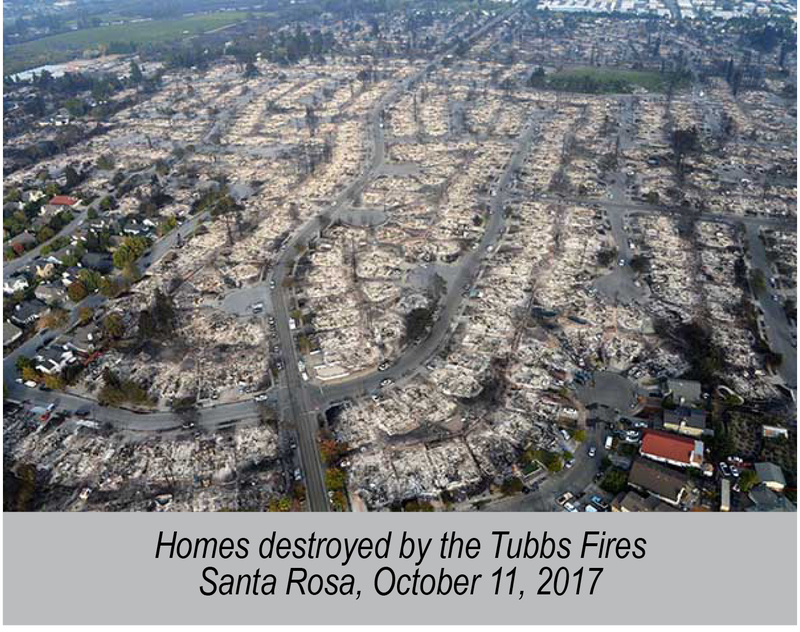 The wildfires that swept through Northern California in October 2017 destroyed more than 8,800 homes, commercial structures, and outbuildings, and damaged another 711. Most of the damage occurred in Sonoma County, which received the brunt of the Tubbs Fire. It started in Calistoga and destroyed portions of Santa Rosa, becoming the most destructive wildfire in modern California history, flattening a total of 5,643 structures. There have been $6.9 billion in insurance claims by nearly 15,000 policy holders of residential properties in Sonoma County alone. On December 4, 2017, the Thomas fire broke out in Ventura County less than two months after the Wine Country fires. It burned 427 square miles and destroyed 777 homes and 286 other structures, mostly in the City of Ventura. On January 9, 2018, a freak rainstorm that occurred a week after the Thomas fire was completely extinguished resulted in flash flooding that caused a major debris flow in the Montecito community of Southern Santa Barbara County. The flood destroyed 127 homes and severely damaged another 294 homes. The 220 room 4 Seasons Biltmore Hotel was closed for 5 months. The San Ysidro Inn has yet to re-open. On July 23, 2018, the Carr fire started in Shasta County. It ultimately burned 230,000 acres and 1,881 structures—mostly homes in the City of Redding—and wasn’t entirely contained until August 30, 2018. The Mendocino Complex fires erupted in late July of 2018 and were comprised of two wildfires: the River Fire and the Ranch Fire. 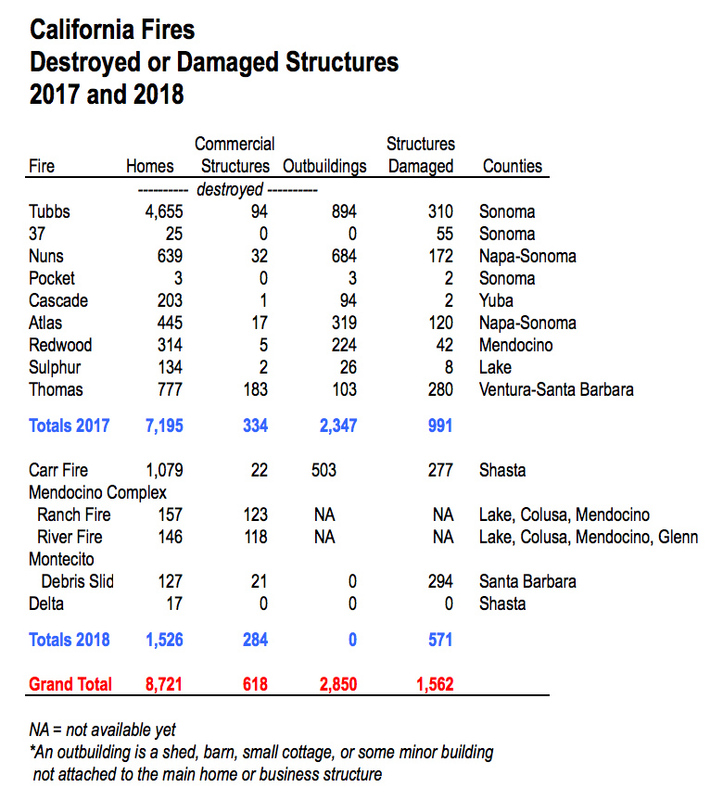 Further destruction of homes and commercial buildings occurred in Lake, Colusa, and Mendocino Counties. It became the largest recorded fire complex in California history, eclipsing the fire burnt acreage of the Thomas Fire. The Ranch fire was not fully contained until September 18, 2018. The Mendocino Complex is the largest wildfire in California history, in terms of acreage burned, but remarkably resulted in a lot less destruction to structures than the other fires over the last year. Altogether, the wildfires destroyed 8,721 homes and damaged 1,562 others. With 10,000 homes needing restoration, this is a major rebuilding effort that will require substantial construction resources, especially construction workers, over the next 3 years. When we forecast the regional economies located in the fire burned counties, we have to account for the rebuilding effort that will occur within the timeframe of our forecast horizon. Consequently, we are forecasting more new home permits in the Counties of Mendocino, Shasta, Sonoma, Napa, and Ventura and a corresponding increase in construction employment and income in California. The state’s six year drought has certainly been a contributing factor to the myriad of fires over the last year. But general climate change is thought to be principally responsible for more fires and greater damage than before by creating ideal conditions for them to burn. 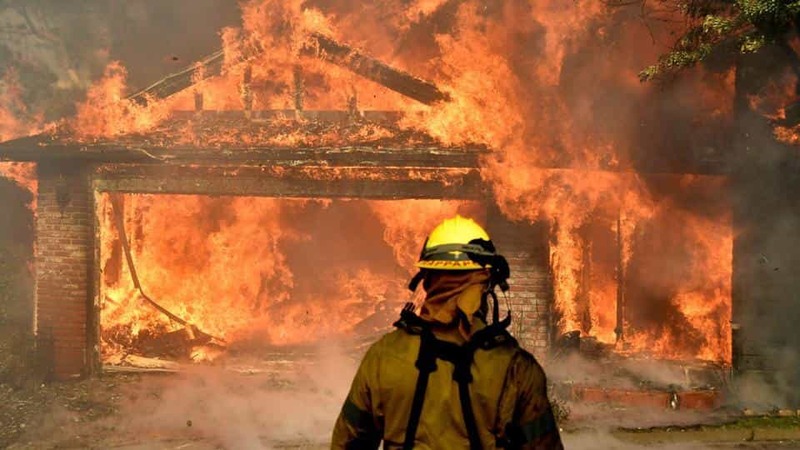 Is the state in jeopardy of a rise in the number, intensity, and cost of fires in the future? Some climatologists suggest that with climate change, wet periods become wetter and dry periods become dryer. So, there is more precipitation in the winter and more growth of vegetation or fuel for future fires. Then, warmer and drier conditions during the spring, summer, and fall increase the chances of fires starting and also encourage them to spread. Therefore, we need to seriously reconsider the building of more homes and other structures in fire prone areas. A study in March 2018 published in the Proceedings of the National Academy of Sciences found that where houses and wildland vegetation meet or intermingle, wildfire problems are most pronounced. And that between 1990 and 2010, nearly 13 million homes were built in these areas in the U.S.
A change in perception about where we are building may be necessary if climate change is truly responsible for the increase and extent of wildfires in California. Building in denser urban locations for housing rather than peripheral areas adjacent to forests or rangelands should be encouraged rather than discouraged to avoid both human tragedy and the heightened destruction of homes and businesses from fire. Rangelands and forest exist in all counties throughout the state. As it is, we are not building enough housing so adding further restrictions on location will be highly controversial. But it may be necessary in view of the increased risk of fire, the soaring cost of fighting fires, and the structural damage that results from their number and intensity.